Zac Brown Band is an American country/folk band based in Atlanta, Georgia. The lineup consists of Zac Brown (lead vocals, guitar), Jimmy De Martini (fiddle, vocals), John Driskell Hopkins (bass guitar, vocals), Coy Bowles (guitar, keyboards), Chris Fryar (drums), Clay Cook (guitar, keyboards, mandolin, steel guitar, vocals), and Daniel de los Reyes (percussion). The band has toured throughout the … United States, including a slot on the 2009 and 2010 Bonnaroo Music Festival. They have also recorded five studio albums, and charted nine Number One singles on the Billboard country charts: "e;Chicken Fried"e;, "e;Toes"e;, "e;Highway 20 Ride"e;, "e;Free"e;, "e;As She's Walking Away"e;, "e;Colder Weather"e;, "e;Knee Deep"e;, "e;Keep Me In Mind"e;, and "e;Goodbye in Her Eyes"e; in addition to the singles "e;Whatever It Is"e; and "e;No Hurry"e;, which peaked at number 2 on the same chart. 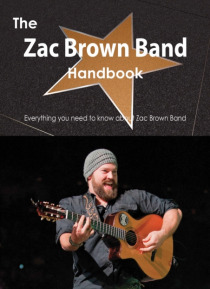 This book is your ultimate resource for Zac Brown Band. Here you will find the most up-to-date information, photos, and much more. In easy to read chapters, with extensive references and links to get you to know all there is to know about Zac Brown Band's Early life, Career and Personal life right away. A quick look inside: Zac Brown Band, 2009 Bonnaroo Music Festival, Adele, Alan Jackson, American Country Awards, As She's Walking Away, Atlantic Records, Bigger Picture Music Group, Blackberry Smoke, CMT Music Awards, Carrie Underwood, Chicken Fried, Chris Fryar, Clay Cook, Colder Weather, Dahlonega, Georgia, Daniel de los Reyes, Esperanza Spalding, Goodbye in Her Eyes, Grammy Award for Best New Artist, Highway 20 Ride, Knee Deep, No Hurry, The Lost Trailers (album), Toes (song), Whatever It Is, You Get What You Give (album), Zac Brown Band discography 143and more pages!Contains selected content from the highest rated entries, typeset, printed and shipped, combining the advantages of up-to-date and in-depth knowledge with the convenience of printed books. A portion of the proceeds of each book will be donated to the Wikimedia Foundation to support their mission.